Across the Virgin Islands, you will find many nice laid-back restaurants serving authentic food such as curry goat or Anegada lobsters and favourite tipples such as the famous ‘Painkillers’. Here are a few suggestions to take your taste-buds to an exciting new place. On the reef surrounding the northeast island of the BVI, Anegada, is the crawling ground of hundreds of enormous lobsters. This particular clawless crustacean is a local delicacy due to its tail being particularly meaty. You are sure to find them on the menu in any beach café across the Virgin Islands. But don’t expect every dish to taste the same. Each chef takes them freshly caught from the ocean and adds their own seasoning secret, making the discovery of tastes limitless. Cooper Island Beach Club, is a very popular eatery which has developed its own secret recipe. 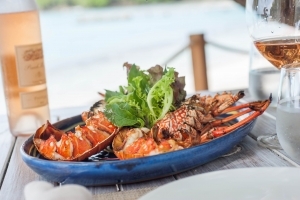 Nibble on grilled lobster whilst you dangle your feet in the soothing waters here for a delightful taste of the Virgin Islands at their best. Curry goat is a trademark traditional dish of the Caribbean. It’s also a fantastic example of the multiculturalism and history that enriches the Caribbean. This melt-in-your-mouth dish has been imported by settlers from Asia who made their way here via Jamaica centuries ago. The curry goat tradition has been spread across the Virgin Islands and become adapted by the spices found in each territory as well as each region’s different culinary techniques. Try this… on doctor’s orders! Belying its rather clinical name, the Painkiller is a tasty famous cocktail you really ought to try in its spiritual home, the infamous Soggy Dollar Bar located in Jost Van Dyke. It’s a delicious blend of dark rum, coconut cream, pineapple and orange juice, finished with a sprinkling of fresh nutmeg from Grenada. The owners of this popular rum-cocktail created in the ’70s have, through the years, been continually perfecting it making it a celebrated tradition across the Caribbean. Sip from freshly picked coconut bought from street sellers. 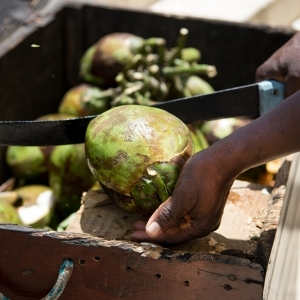 Coconut water doesn’t get any fresher and more refreshing than this! To find out more about chartering in the Caribbean, call +44 (0)207 499 5050 or email us.